October has always been my favourite month, probably because it was when I was born. I love the colours of autumn; the leaves turning to red and gold, the berries shining on the trees, the low sun casting a warm glow everywhere. I enjoy hearing the sound of leaves crunching under my feet, watching squirrels scurrying around collecting nuts for their winter store and finding toadstools sprouting in expected places. With all this going on, it’s the ideal month to explore a nature reserve. Braywick Nature Centre, just outside Maidenhead is the ideal place for a day out in the half term holidays. To reach the Centre, exit the M4 at Junction 8/9 and then the A308(M) towards Maidenhead. At the roundabout turn left onto the A308 and then back on yourself to the opposite side of the dual carriageway as soon as you can. Head past Braywick cemetery and take the next left down Hibberts Road, signed to the Nature Centre. From Maidenhead station, walk south along the A308 Braywick Road until you get to the left turn for Hibberts Road, just before the M4. The trails all start from the Nature Centre, the Virginia Creeper clad building on the right of the car park. Events run from here include pumpkin carving, seed gathering, fungi forays and birds of prey talks. Here and at the information point in front, you can stock up on leaflets with maps and details of the nature trail and the tree trail. The tree trail is around a kilometre long and ideal for teaching children and learning as adults about different types of trees. There are twelve to spot in total along the route; the shady Oriental Plane; the fruity Western Red Cedar; the Scots Pine, which has already shed many of its needles; the European Lime, said to ward off evil spirits; the crimson Norway Maple; the oddly-shaped Monkey Puzzle Tree; the tall North American Red Oak, the Walnut introduced by the Romans and later used to make gun stocks; the Beech which many breadboards are made from; the acorn-scattered Pedunculate Oak; the Californian Coast Redwood near the pond and the Wellingtonia named after the Iron Duke. How many can you recognise? To make life easier (and parents look brighter) there are small name plaques on each tree. The nature trail goes somewhat further, following the tree trail initially from the Nature Centre. This whole area were the tree trail is used to be Braywick Lodge, home to the Hibbert Family. The house stood from the eighteenth century until it was demolished in 1969. The formal gardens, where the grass used to be cut by horse-drawn mowers, now houses the unusual tree collection. Stay to the left past the cemetery gates to find the new Arboretum (which means “tree garden”). Some of the best toadstools are in the Arboretum; Jews Ear fungus on the tree bark, enormous field mushrooms under the horse-chestnut tree, scaly parasols and weeping inkcaps amongst the grasses. 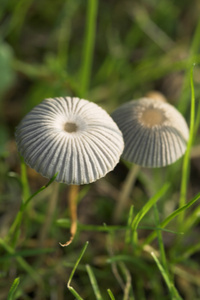 Be really careful about collecting fungi though, as it’s hard to discern which are edible from which aren’t. Avoid an upset stomach by joining an organised forage to be guided by the experts. The route picks up the old Green Lane from here, known as Green Way or part of Cycle Route 4, an 8km path which forms a waterside corridor from Cookham, through the centre of Maidenhead and whose sights include a (bronzed) hippo and its young. This (then 16km) route can be made circular by joining the Thames Path at Cookham and following the opposite bank 8km back to the footbridge by the M4, then taking Monkey Island Lane and Old Mill Lane back to the beginning in Bray. If you don’t fancy a walk that long, you can stay within the nature centre, listening and watching for green woodpeckers near the steep-sided area in the middle of the reserve, where young trees have been planted on a reclaimed refuse tip. The trail heads back along a flood-relief ditch, originally built to carry flood water from the Thames but now home to swans, coots and the occasional water vole. Back near the Centre the trail runs past a small copse before reaching the lily-pad covered pond which attracts smaller mammals and birds and finally the dell, planted with grasses, flowers and shrubs, which part of original Braywick Lodge garden. To head to the picturesque village of Bray along the Green Way, turn left out of the car park onto Hibberts Road and join the footpath to the right of Holly Cottages. This takes the Causeway down to the main road opposite the 15th Century Hinds Head Hotel. The nearby footpath leads through the graveyard of St Michaels Church where, if you go out of the exit at the back on the right, you can have fine dining by the Thames at the famous Waterside Inn. Alternatively, the child-friendly Stafferton Lodge back on the A308 on the other side of the cemetery near the garden centre currently has starters and puddings for £1.50 each when you buy a main course.